Other Information: MITAGS-PMI, with over twenty years of mari- more expected to come on line in 2017. 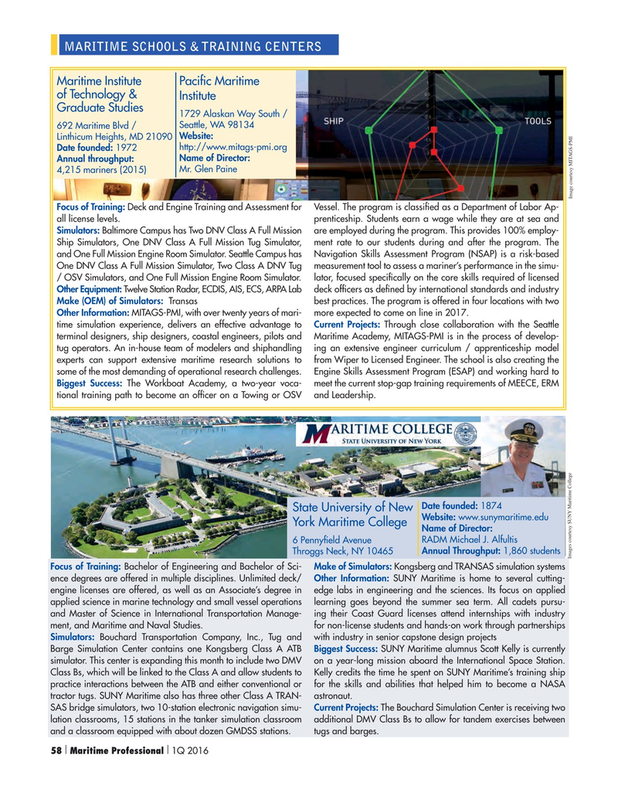 Biggest Success: The Workboat Academy, a two-year voca- meet the current stop-gap training requirements of MEECE, ERM tional training path to become an of? cer on a Towing or OSV and Leadership. Barge Simulation Center contains one Kongsberg Class A ATB Biggest Success: SUNY Maritime alumnus Scott Kelly is currently simulator. This center is expanding this month to include two DMV on a year-long mission aboard the International Space Station. Class Bs, which will be linked to the Class A and allow students to Kelly credits the time he spent on SUNY Maritime’s training ship practice interactions between the ATB and either conventional or for the skills and abilities that helped him to become a NASA tractor tugs. SUNY Maritime also has three other Class A TRAN- astronaut.